Last week I posted about a Le Tour I was going to buy, but passed on it. It was already restored and I'm looking for something I can restore myself. And by restore I mean disassemble, clean, grease and put back together and ride. Not looking to make it in original showroom condition. I wanted steel so the World Sport is first on my list, but I'd take the 564 too. The 564 does have the original quill seat post so I will be sure to check out if it's cracked or not. Of those two, is one going to be better to fix up than the other? I'm not worried about value or anything like that, I just want to start getting into older bikes now. 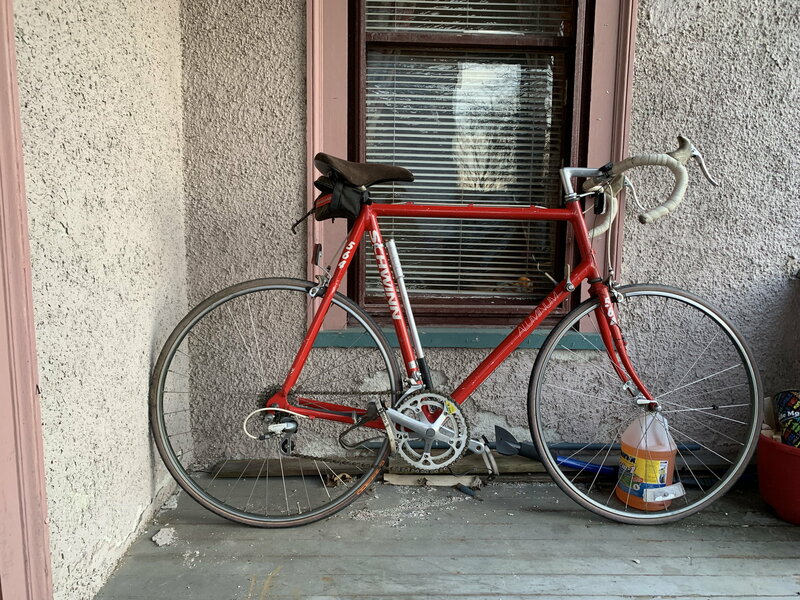 I'm hooked on Schwinn because that's what I grew up with, but what else can I be looking for as far as a steel bike from the 80's? The 564 aluminum frame was designed in conjunction with Klein and is a very nice ride. It would be my pick of the two. But there's that pesky quill seatpost on the 564. They tend to crack and leave you high and dry. Thanks for that link. There's a YouTuber, RJ the Bike Guy, and he modified a normal seat post by using a long stem bolt and wedge from a stem, and fitted it to the normal seat post. I haven't looked at the bike yet, but that's one of the first things I will check out. I personally think the world sport is an underrated bike, but I am not familiar with the 564. Looks like either one fits the bill. Not much to go by on the 564 with that one pic. If your a casual rider then the world sport is the way to go. Looks to have been taken care of and the owner kept the paper work. A lugged steel frame reliable components. ( my son runs cc at edinboro and rides a world sport around the back roads. 27 1/4 tires with shrader tubes. The 564 is speed bike, a pretty good one. The World is ok for what it is a tourer and looks cleaner. Do you need racks or fenders? Myself I'd take the red one, they go faster! I'd take the WS, but I'm sentimental: I had that exact bike. It was a HS graduation present and I rode it all through college and law school. I raced triathlons and commuted to my first job on it. I wish I still had it. I'd probably convert it to a city bike for commuting. If you walked into a bike shop in the mid 70’s-early 80’s and asked for just a bike that didn’t cost too much, you rode away on something like that World Sport. The 564 is a racing and training bike from the years just before carbon fiber took over. It was a much more expensive bike, and newer (early 90s). First impressions can be deceiving but the World Sport looks much better taken care of. Last edited by Darth Lefty; 04-12-19 at 09:22 AM. Yep. I think the WS was the entry level road bike. It had stem shifters, suicide brake levers, and foam pipe insulation style bar covers. I tried to make mine as racy as possible by wrapping the bars with cello tape and putting clips and straps on the rat-trap pedals. I had a Traveler in high school so I'm leaning towards the WS. And it is going to turn into my running errands bike, so the WS may be more suited for that. As Mr. 66 said though, red is always faster! As typical with this stuff though, I can't get any response from the WS seller. I had the person selling the 564 measure it and they say it's 26". I'm assuming they measured incorrectly and it's 25" frame. It may be too big as I normally ride a 58cm, so 23" is what I need. Congrats! First order of business is to remove the quill seatpost and examine for cracks, because if there are any, you won't want to be using it until you get that sorted out.